As we mentioned a couple of weeks ago, there were Lincolns, there were Continentals, and there were Lincoln Continentals. 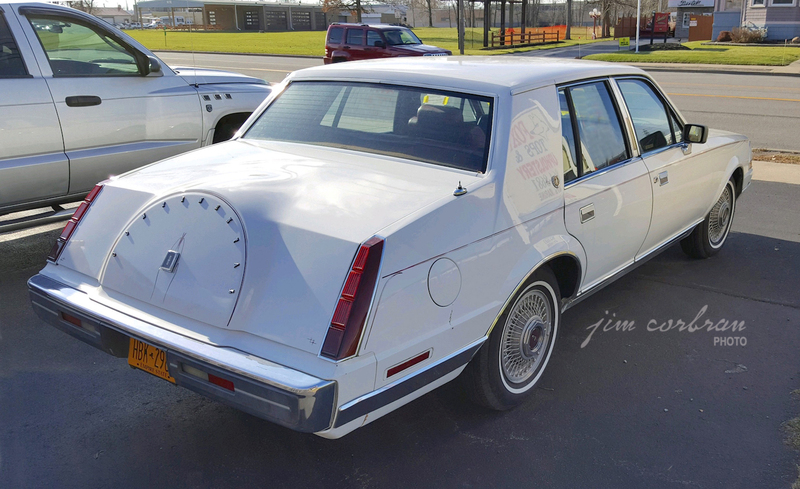 Lincoln called this 1985 Continental “…a stylish blend of luxury, technology.” If you’re like me, you were waiting there for a third trait, or at least wondering what happened to the “and” after luxury, but this is how it went down in that year’s brochure. The ’85 Continental was smaller than the ’85 Lincoln Town Car, but really, what car wasn’t? There was also a Mark series car for ’85, the Continental Mark VII, which would be the penultimate Mark series (the Mark VIII appeared in 1993, and was discontinued after the 1998 model). This white four-door was seen over the summer in Kenmore.